Have you ever wanted to explore a remote island and unplug? Sleep in a wooden tree house and have it all to yourself? Wake up to the sound of the ocean waves? There’s a place near Bali where you can do all of that, and it’s very budget friendly. 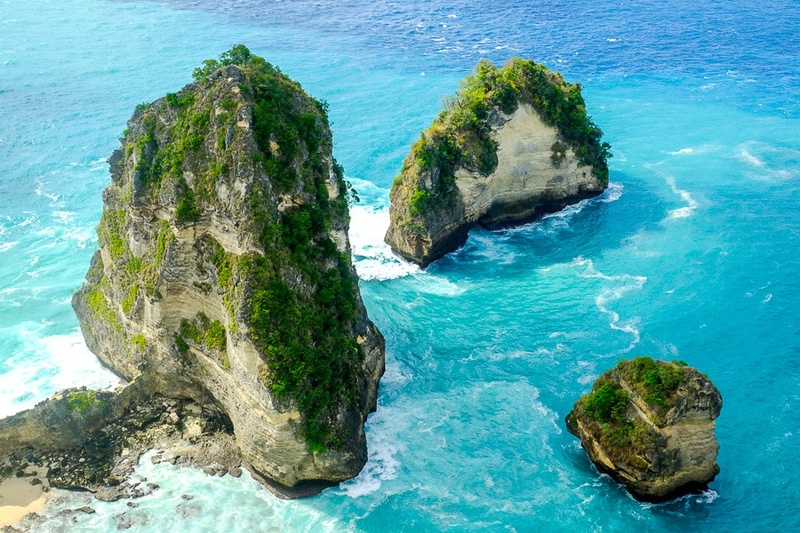 The island is Nusa Penida, and the name of the place is Rumah Pohon Molenteng (‘Rumah Pohon’ is just Indonesian for tree house, and Molenteng is the name of the village). I first visited the treehouse in 2017, and then came back and stayed a night in it the next week, and it was probably one of the coolest things I have ever had the pleasure of doing in my travels. The room and bed are very basic, but the views and location are out of this world. You will feel like a modern day Robinson Crusoe, guaranteed. This is tree house #2, which is where I stayed on my first visit in 2017. When I stayed here, I fell asleep to the sound of geckos chirping in the trees and woke up to an incredible sunrise over the Raja Lima islands, with dolphins and manta rays swimming and jumping in the distance. Today, this is sadly not a hidden spot anymore thanks to this thing we call the internet, but I still think this tree house is probably one of the most incredible places in Bali. Even if you don’t have time to stay a night here, you can still visit the tree house and take some photos by it. This is the view from tree house #1. Stunning, but I like the view from house #2 even better. You can make a booking on AirBNB to stay in a tree house here. The price is incredibly low for the amazing experience you get. There is a small outhouse nearby, so you have the essentials, but there’s no WiFi of course (I had a weak 3G reception sometimes but it was barely usable). As of 2019, there are actually a total of three tree houses here. I stayed in tree house #2, which sits at the edge of the front cliff and arguably has the best view. You can stay in any of them though, and they all have great views of the nearby islands and cliffs. The tree houses sit on a short peninsula with huge cliffs and epic island views. The third tree house was just added in 2018, and seems to be the most upscale, but I haven’t had a chance to check out what it looks like inside yet. Believe it or not, all of the tree houses here have electricity wired to them for fans and lighting, which is handy if you stay the night. If you continue walking past the tree houses until you reach the point, there’s a small Hindu shrine and a little Balinese style hut that you can sit under to escape the midday heat. This is tree house #3, newly added in 2018. Raja Lima (Five Kings) is a viewpoint you will see first when you reach the parking area, before the short hike down to the tree house. This one is sometimes called ‘Pulau Seribu’ (Thousand Island) viewpoint, and it’s named for the 5 big rocks scattered across the ocean below. Three of the ‘kings’ can be seen in the picture below. This viewpoint also has a neat warung (cheap food & drink shack) so you can pull up a chair and enjoy the view with a Coke in hand. It could be considered another free bonus when visiting the Rumah Pohon tree house. Three of the five ‘kings’ sitting on the ocean. One of the best views I’ve had while sipping a Coke. 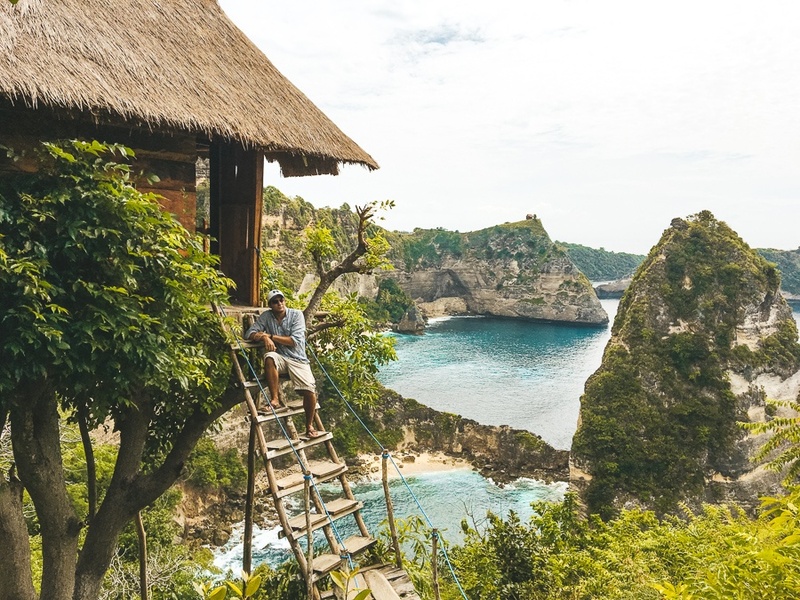 The tree house is on the southeast side of Nusa Penida island. It’s accessible by car or scooter, about 1 hour drive from the main docks and accommodation in northern Penida. Be careful if you go by scooter because the road is rough and may be dangerous in some spots if you don’t take it slow! The entrance fee for this whole area is 10,000 IDR (70 cents) as of 2019. The parking location in the map below allows you to visit 4 incredible locations all within a short 10-15 minute walk of each other: Raja Lima, Rumah Pohon, Atuh Beach, and Diamond Beach. From the parking, it’s a short 5-10 minute hike down to the tree house. If you’re looking for more info on how to get to Nusa Penida island in the first place, you can find that here. Drone shot of the epic cliffs and tree houses. The thatch view from tree house #2. If you’re on a tight schedule or want to skip the extra steps involved in arranging your own trip to Nusa Penida, there are a number of companies that offer prearranged day trips to Penida for as low as $50 USD, complete with hotel transfer, island tour, lunch, and same day return to Bali (or Nusa Lembongan).